Equal Exchange Organic Coffee prides itself on being Fair Trade, and for good reason. They do a lot of outreach and connection with their farmers to make sure they are well taken care of and everything is on the up and up. Currently, their breakfast blend coffee sits at 4.4 stars, along with an Amazon's Choice badge. So Amazon seems to approve of them, enough to recommend them outwardly. Let's see if we can find out what's so good. This specific Equal Exchange Organic coffee is their Breakfast blend. It is in fact a blend of their Medium roast and Fresh Roasted coffees. It has a great body, terrific aroma, but the taste and aftertaste seem to lack a bit. However, everyone's taste for coffee is different. If you like a sweeter tasting coffee with chocolate undertones, great because that is what this one has. If not, you probably will not like this one. Customers have also reported that the Breakfast Blend has low acidity which is great to see. High acidity can ruin an otherwise great coffee. All of the coffee from Equal Exchange is grown in Latin America. They have small local farms spread throughout Latin America including Guatemala, Peru, Mexico, and many more. It is very rare for coffee to have a single origin. But just because it comes from different areas does not mean it is bad. They process their beans through non-chemical means to eliminate any threat of mold ending up in your coffee. As for authoritative seals, Equal Exchange Organic Coffee cuts no corners. Their coffee is USDA Organic certified. Also they are of course Fair Trade certified because that it literally what they have built their company on. They are the most Fair Trade coffee company that we have featured here. Beyond that, they also have Arabica coffee beans, however there is no seal to cover that claim. But in their ingredients, they do have Arabica listed. Their website says that most of their coffee is shade grown. And just by looking at the company's practices it is hard to doubt that claim. Overall, it does not look like they have any claims that do not have something to back them up. One very interesting thing that this coffee advertises, that I have not seen a lot of, is kosher. All of their coffee is certified OU (OrthodoxUnion) Kosher. For those who do not know, Kosher means that it was prepared in accordance with Jewish dietary law. This is something totally unseen in the coffee world. The fact that Equal Exchange Organic coffee has this under their belt is a huge deal. Equal Exchange Organic coffee is headquartered in West Bridgewater, Massachusetts. It was founded in 1986 by Rink Dickinson, Jonathan Rosenthal, and Michael Rozyne. Since its inception, Equal Exchange has been devoted to increasing incomes and stabilizing the economic situations of farmers. They are one of the best Fair Trade coffee companies out there. They literally named their company on this ideal. They ensure that all of their small, local farms are well compensated and nothing goes through middlemen. 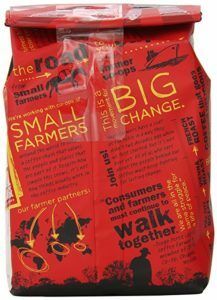 Equal Exchange Organic coffee is in fact the oldest and largest Fair Trade coffee company in the United States. Another really awesome thing about Equal Exchange is that it is worker owned. The company is actually recognized as a Worker-owned Co-operative. This means that there are no outside shareholders of the company. Each of the workers owns a part of the overall company. In addition, each worker is entitled to the right to vote on company policy and decisions, has the right to serve as the leader of the company (i.e. board director), the right to any and all information, and the right to speak their mind. What's more, the highest paid worker can not earn more than 4 times what the lowest paid worker is paid. This is virtually unseen in the majority of businesses in the entire world. So the fact that this company has achieved this and is thriving, is just incredible. Equal Exchange Organic coffee is totally certified. USDA Organic, Fair Trade, and Kosher. Kosher is something that is basically unseen in the coffee community. The coffee is taken from shade growing, small local farming cooperatives throughout Latin America. Their farms can be found in places like Guatemala, Peru, even Mexico. The Breakfast Blend coffee has a nice body with a fruity undertone. If you like sweeter breakfast coffees, this one is definitely for you. They also only use the best Arabica coffee for all of their coffees. Arabica coffee is very good quality, some of the best in fact. The company Equal Exchange is just fantastic. Worker-owned, Fairtrade, and a lot more. They are also the oldest and largest Fairtrade coffee company in the United States. The Breakfast Blend is a sweeter coffee. If you are not a fan of sweeter coffee, may not be best for you. Also, the taste, as well as the aftertaste, are a bit lacking overall. It is only available in a 12-ounce bag and only available in ground form. There is no way to get the whole bean, if you are a fan of that option. Equal Exchange organic coffee is terrific. While for some, the taste is lacking a little, many still enjoy it. Not to mention everything behind this coffee is absolutely awesome. Organic certified, Fairtrade, more than we have seen ever before. Even certified Kosher! In addition, the company is just great. Worker-owned, fair pay to all of their workers and farmers, job security, and so much more. Equal Exchange definitely lives up to their name. Here are some top questions that I found for people seriously considering buying Equal Exchange Organic Coffee. How coarse is the grind? This is fine ground coffee.